Are you looking for a deck builder near you in Farmington Hills? Here at Miles Bradley, we build composite decks in Farmington Hills. While they are stable and dependable, they are also unmatched in beauty. With decades of experience and customer satisfaction, we are there to help you make the custom deck of your dreams. Farmington Hills is a beautiful and prosperous Michigan city. The schools are top-of-the-line and the area is shrouded in wealth. The beautiful houses should be accompanied by beautiful custom decks! A nice deck can make or break your home, so why not aim for the best? Unlike a wood deck which shows its age over the years, low-maintenance composite decks are built to last. 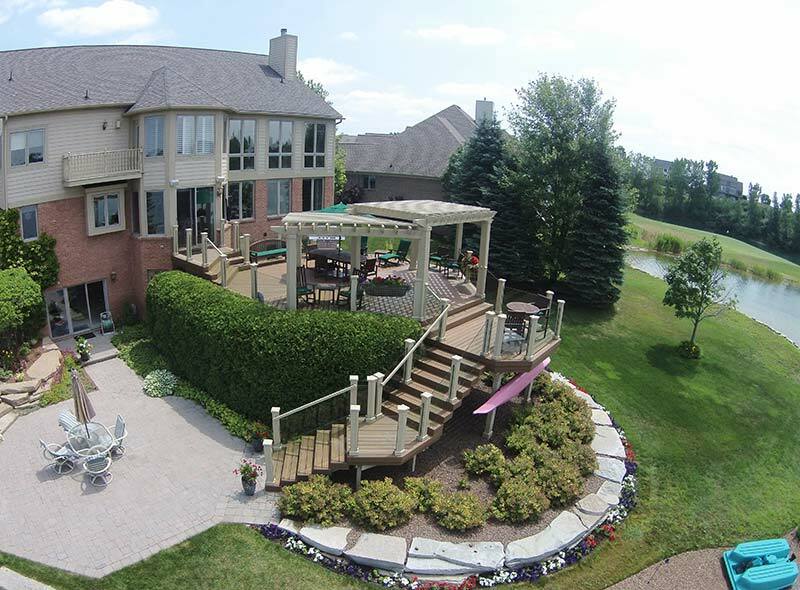 Composite decks are made from Trex materials that can withstand harsh Michigan weather patterns. That is why more and more homeowners are seeing benefits of low-maintenance composite decks. They maintain their beauty for a longer amount of time and by requiring little-to-no maintenance, they are practical for anyone. Furthermore, there are several advantages to having a composite deck. The deck boards are made from recycled materials so you will not have to worry about killing trees in order to get new wood. Composite decking is designed to resist scratching, fading, staining and mold. Also, unlike wood, composite decks are insect proof so you have no threat of infestation or material damage. At first, a composite deck will be higher of a cost but in the long run with way less maintenance and a longer durability, you will save money. If you are interested in building a new composite deck, contact Miles Bradley right away! We treat your home like it is our own, the care only expected of family. The best place to go to for a new deck is here with our decades of experience and customer satisfaction. Finally, request a quote from us today! Are you looking for a brand-new composite deck for your dream backyard? You have a few choices on what to make your deck out of. Trex, the world’s number one decking brand, TimberTech, America’s number one in premium decking, or original wood, an easy material to use that is the go-to for many people. Each material has its own advantages and disadvantages, so we cover the great Trex vs Timbertech debate. Trex is an eco-friendly decking material. Unlike wood, Trex decks come will not rot, split, swell, or crack from insect infestation. And because the color is ingrained within the material, Trex does not require repainting, annual staining or sealing. TimberTech is number one in premium decking. These decks are durable enough to withstand almost anything your family, friends, and the elements throw at it. They do not require any staining or sealing in its long-lasting life in your backyard. Wood decks are the original design that many flocks to in the spring and summer months. Even though wood is in need of replacement every couple of years, wooden decks are easy to construct at a reasonably affordable price. Unfortunately, this resource is scarce and can lead to deforestation. It also splits and splinters with age. So, perhaps wood is not the best option for today’s standards. 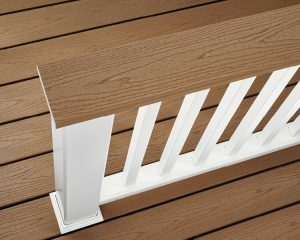 Trex is by far the best and most reliable brand to use when constructing a deck. Your deck will last for years to come with Trex as its construction base. You can make the deck of your dreams in the color of your choice. So why wait? Contact Miles Bradley Decks today to get a free quote! We can make your deck in any color you choose. Our main seller is Trex but we can do whatever you’d like most on your favorite deck. So, let’s make your dreams a reality, call us today or contact us through our form! Miles Bradley has been busy this summer! Offering a variety of composite deck materials that comes in different grain patterns and colors, along with full deck planning and all the extras you can add onto your deck. As a certified Trex Pro Platinum builder we build low maintenance deck using composite deck materials. Check out this new deck build In Novi, MI with our favorite products from Trex.